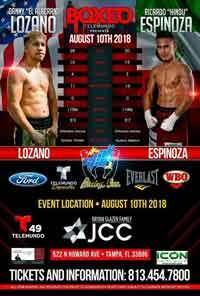 Review by AllTheBestFights.com: 2018-08-10, nice toe-to-toe fight between Daniel Lozano and Ricardo Espinoza Franco: it gets three stars. Daniel Lozano entered this fight with a professional record of 15-4-0 (11 knockouts) and he is ranked as the No.21 super bantamweight in the world. He lost three consecutive losses in 2015 but then he took revenge in 2017 with two out of the three opponents who had beat him: David Carmona (David Carmona vs Daniel Lozano 2) and Ricardo Rodriguez. His opponent, Ricardo Espinoza Franco, has a boxing record of 20-2-0 (17 KOs=85%) and he entered as the No.156 in the same weight class. He lost to Christian Nieto Ayala last year (via split decision) but then he has won ten consecutive fights beating German Aaron Cota in his last one. Lozano vs Espinoza is valid for the WBO Latino bantamweight title. Watch the video and rate this fight!